At a young age, Mom and I developed an understanding about me and the morning. Tread gently or waken the hibernating bear. It is one of her many graces that she knew me to be a creature of the night, my creative outlet waking up when the sun set to sleep. One evening when Tita lived with us, she remarked to Mom how bad the thunder had been the night before which elicited a giggle from me and a puzzled look on Mom’s face. I had been moving furniture and re-arranging my room the evening before, envisioning a new layout and convinced I couldn’t sleep until it was in place. I was the kid that kept a style book for interiors with a high need for change. Thus, Mom never turned on all the lights to burnish the room with mock sunlight. She never threw back the covers laying me vulnerable to the chilly morning air. Instead, she would awaken my olfactory senses knowing the others would soon follow. Piercing my nostrils might be the warming smell of sunshine, of eggs being turned in a pan. And depending on what other aromas mingled with that first one, I had a pretty good idea of what might be waiting. She would come into my room and say, “Annelies, you have 10 minutes before you need to get up.” The recognition of the nose as alarm clock somehow roused me a little before that deadline if not right on time. Waiting for me would be a homemade breakfast that gentle nudge of a mother wanting to nourish her child and for that child to succeed at school. My Mom knew the way to my heart. I have been volunteering with Share our Strength this year believing no child should go hungry and understanding that sometimes though all parents want to provide a food stable environment for their children, they simply do not have the resources. SOS seeks to connect families in need with the services that can provide nutrition counseling and food resources. Last year, 17 million children in the United States went hungry, finding themselves the recipients of school cafeteria programs and in food unstable homes. If you’re in San Francisco April 7th attend Taste of the Nation at the Bently Reserve to help support Share Our Strength. The best part is that these events are raising funds that will be funneled back into our community. From my volunteer work, I’ve had an opportunity to interview participating chefs asking them about their favorite childhood food memories and what Share our Strength means to them. Each of them has a dynamic answer and is sharing their strength by cooking a feat for Taste of the Nation attendees. All proceeds from this event are going back to Food Runners, SF Fresh Approach, and Children of Shelters. If you’re in town May 14th, swing by the SF Food Blogger Bake Sale, being held at 18 Reasons for homemade baked treats with all proceeds going back to Share our Strength. This national bake sale encourages home cooks (and in this particular assembly food bloggers) an opportunity for them to share their strength of baking for the good cause of SOS. I am helping organize the event with friends made from last year’s Food Blogger Bake Sale: the accomplished Anita of Dessert First, the indomitable Irvin of Eat the Love and the effervescent Shauna of Piece of Cake. I am grateful that I never went hungry as a child and am volunteering with Share our Strength to do my part to ensure that can be true for other children. 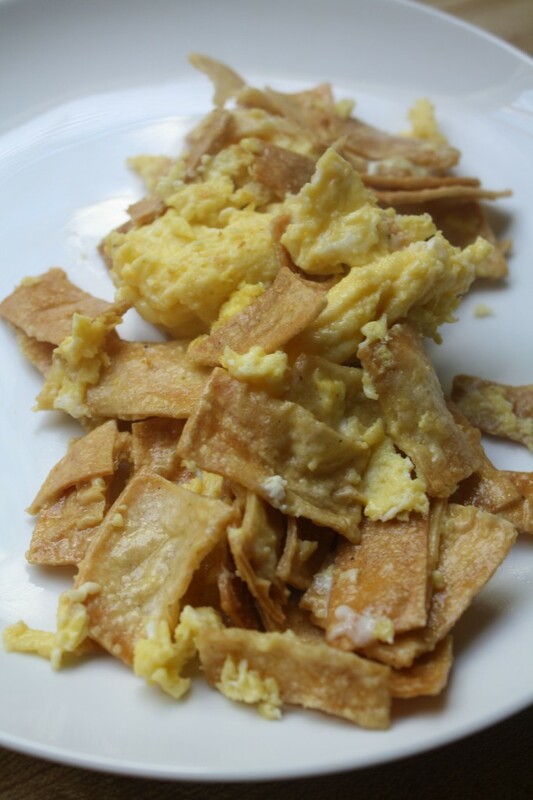 And anytime I’m feeling homesick or a bit blue, my comfort food of choice is migas. The kitchen wafts again of smells from childhood, of rousing from sleep to take action, of being loved. 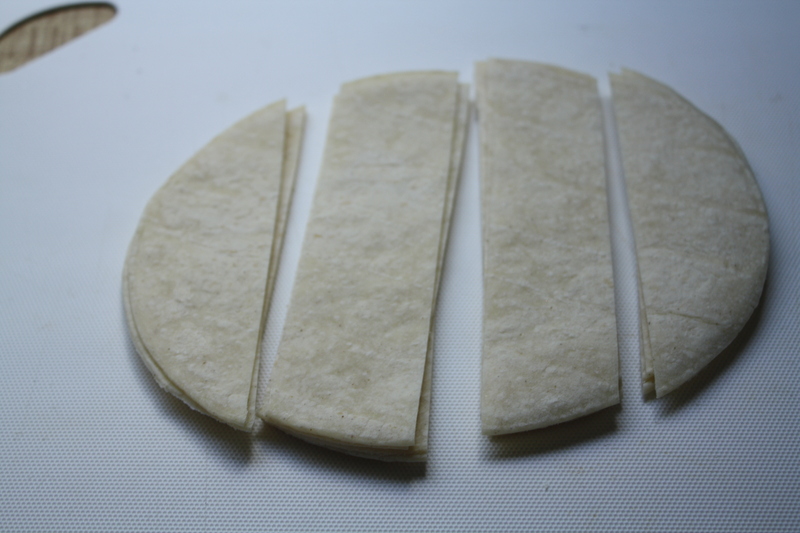 Use this recipe to make fresh tortilla chips, but cut them into short strips instead of triangles, as shown below and then continue on with recipe link. 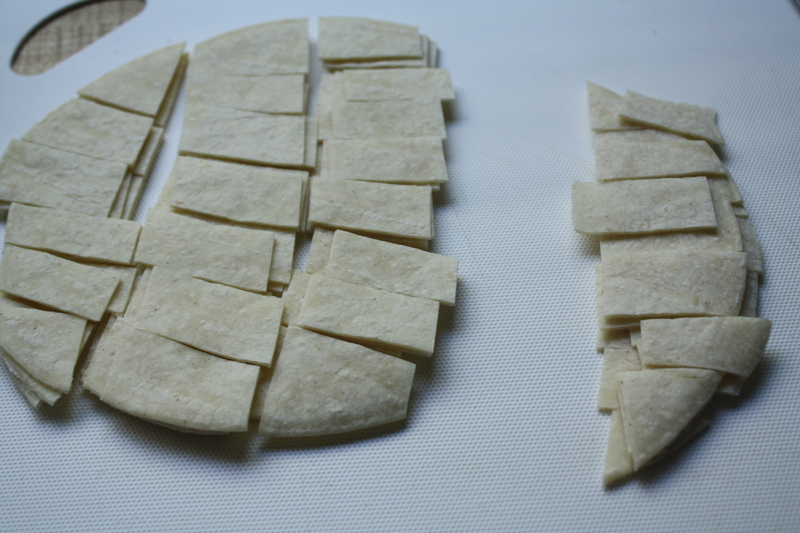 In a large pan, add chips. Set over medium high heat. If you made the fried chips, no need to add extra oil, but if you made the baked chips, you might want to add 1 tablespoon of oil. Add salt and pepper to scrambled egg mixture and whisk. 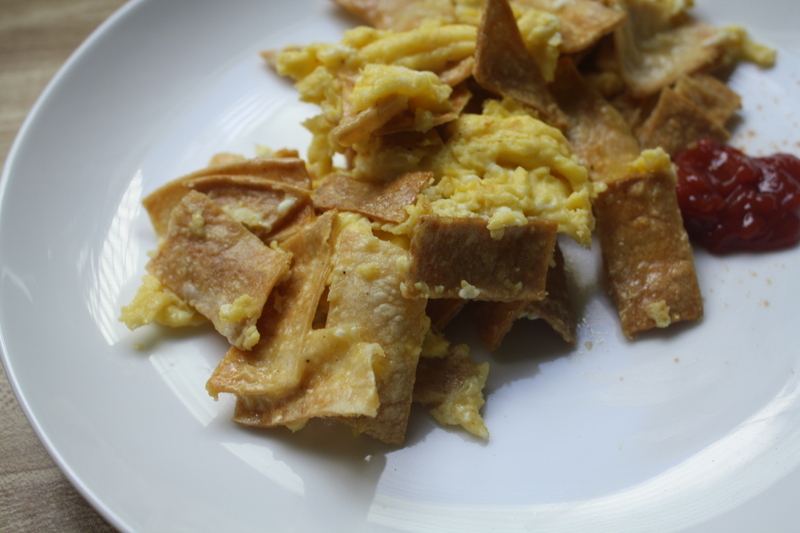 Then pour scrambled egg mixture over the chips. 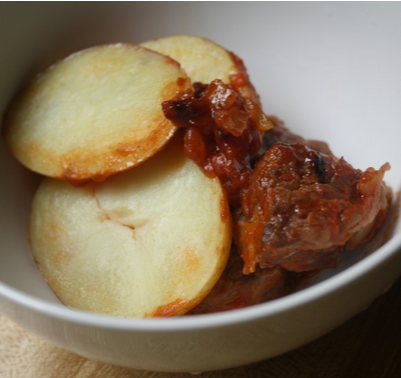 Toss and turn the egg-enrobed chips until the egg fully cooks. This is a beautiful post, A! I love the recipe, too. I sort of can’t believe I’ve never had migas? They seem right up my alley. I’ll definitely give them a go this weekend. Thanks A. 🙂 Migas are fantastic and so easy. I’m a fan of egg dishes and these are up there. 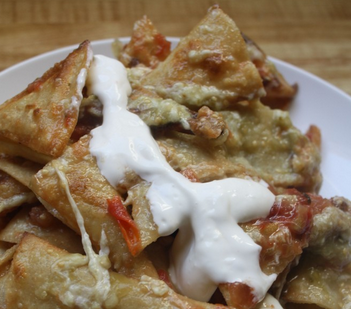 Let me know how your migas turn out (they would work on your hunger challenge well too). She is a gem. I think you two would get along.